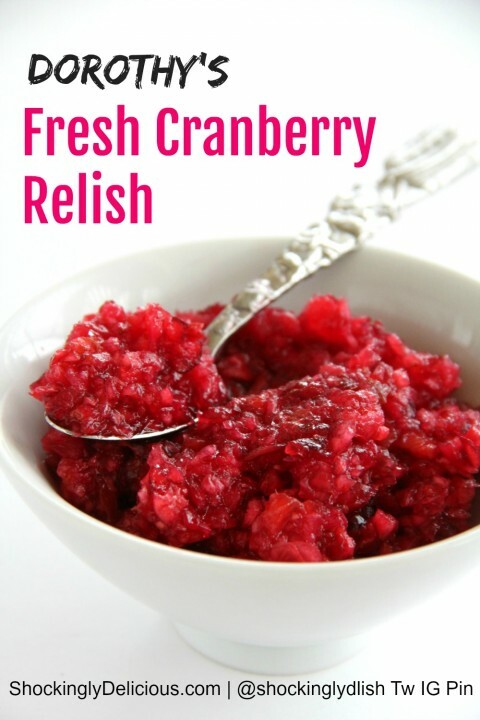 Summary: Dorothy’s Fresh Cranberry-Ginger Relish is a bright, zippy, raw, fresh relish that will add a hot-sweet spark of life to your Thanksgiving or holiday turkey dinner plate. Wash cranberries in a colander, remove and discard any bruised or soft berries and pat the berries dry on paper towels. 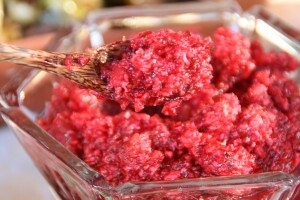 Add cranberries, lemon zest, sugar and ground ginger to the bowl of a food processor and pulse until the berries are finely chopped (do not allow it to become puree). Pulse in the minced crystallized ginger and spoon mixture into a covered container. Allow to rest in the refrigerator for at least 4 hours so the sugar infuses the berries. (If you serve it right away, the sugar will still be gritty.) You may make it a day or three before, and it will be all the better for it. Makes about 3 cups. Serves about 12 (1/4 cup per serving). Oh, who are we kidding? It serves 6, maybe 8 at my house! Leftovers? : Eat it with roasted chicken or pork. Slather it on sandwiches (it can really liven up boring lunch meat). Dollop it on a bowl of cottage cheese or Greek yogurt. Heck, spoon it over vanilla ice cream! What else can you eat Fresh Cranberry-Ginger Relish with? On vanilla ice cream for dessert! 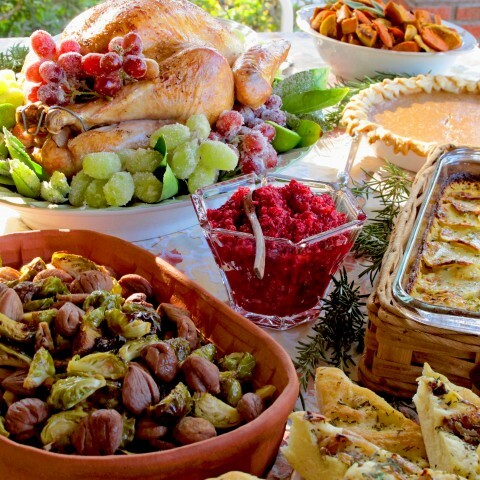 See anything else on our Thanksgiving table you might like? Here are the recipes for our whole feast, prepared by some of Los Angeles’ finest food bloggers. All of their recipes and sites are worth a visit. Tell ‘em I said hi! This article was originally published on Shockingly Delicious Nov. 16, 2011 and has been refreshed and republished Nov. 14, 2018.